Writing With Springtails… Where has Spencer Been? Authors have a hundred excuses to avoid writing. They are the same ones everyone uses to avoid doing anything. I have one that is unique, but it’s not an excuse… it’s a valid reason: springtails. It was a mystery for quite a while and still is. I guess that’s fitting, given that I write… well, you know. Aside from the professionals I have talked to, only one of my friends had ever heard of them, my fishing buddy, Tom. Carol and I had never heard of them, and we certainly wish we still hadn’t. The fifth Spencer story was rolling along nicely back in the spring. It’s all plotted in my head. I was writing at least an hour a day and had about 20 percent of the book done. 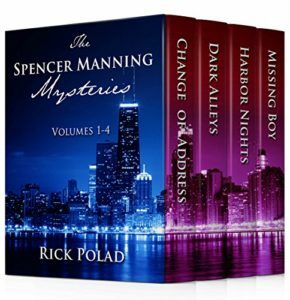 Spencer is hired by a Chicago crime figure who has been arrested for murder. That creates a moral dilemma—does he want to work for someone he would rather see in jail? Then, back in May, Carol saw a speck of dirt on the white wall in the basement. When she went to wipe it off, it moved. And things got worse… much worse, from there. So it moved… big deal. Everyone kills bugs. She didn’t think anything of it until she saw a few more. The odd thing was when she went to smush them, they hopped, like fleas. She told me about them and I shrugged and said, “They’re just bugs, they come in the windows.” When she called me to come and look at the bugs she was seeing in the bathtub upstairs, I got concerned. She pointed out that they looked like the same bug in the basement. There aren’t any windows in the bathroom. The mystery was afoot. It was time to identify the little basta… uh, bugs. I caught one on a piece of tape before it hopped and put it under the microscope. I didn’t like what I saw. I imagine you are agreeing. The bug in the picture is a little larger, but most are about the size of a pencil dot. The mystery didn’t seem too difficult to solve. They must be coming up the drain. We treated the drain and they kept coming. Every day we would find a few in the tub and more in the basement. Pretty soon we were finding them in every sink and tub, and on walls and window sills in every room in the house and some closets. Before it got to that point, I called our pest control company whom we have come out quarterly. We live next to a marsh so that seemed like a good idea when we bought the place two years ago. They have a policy that if we see bugs between treatments they will come out at no charge and spray. When I told them we were seeing bugs they said they would be right out. They asked if I knew what kind of bug. I said, “springtails.” The other end of the phone was silent. After a few seconds, he said, “oh,” in a tone that made it clear this was not good. But they did come out and spray the entire outside of the house, the ground out to five feet around the foundation, and the windows and floors where we were seeing them in the basement. He said that should take care of it. By the next week we were seeing them everywhere. This not so fun mystery sparked lots of questions. Where were they coming from? What were they doing? Were they multiplying? Where’s the best spot to start a fire, and would it look suspicious if we got all our stuff out first? But mostly, how do we get rid of them? We found the answers to most of our questions on the Internet… and also a hint that it could get worse, much worse. We were seeing them in small numbers… maybe ten in a room. But there were horror stories of people who had walls and floors covered with tens of thousands. As a scientist, learning about these creatures would have been interesting if they weren’t in our house. It is amazing that no one but Tom had ever heard of them because they are the most prolific bug in the soil—with over five hundred species, they are almost everywhere. If you garden, you have seen them. You just didn’t know what they were. They like moist soil; they need moisture to live. So when the soil dries out, as it did here in late spring, they migrate looking for moisture. If they don’t find moisture, they will die. They have no clue where they are going, and they can move into a house if they find openings. They come in various colors. Most are black or gray but I have seen green, blue, white, and iridescent. They are called springtails because of the large tail that they push against a surface if they are threatened, which pops (or springs) them into the air. The only good part of this horror story (sorry for the genre switch) is that they are harmless. They do no damage, they don’t bite, they don’t get into food and everything else like cockroaches, and they don’t carry disease. But they do multiply by the tens of thousands very quickly. The only purpose they seem to have is to make people want to burn their houses down. By the way, I do realize how stupid that would be. The pest company came back out, for free, and sprayed every inch of the inside of the house. They again said that should do it but to call them in ten days if it didn’t. We had to wait for the bugs to encounter the poison and die. So we were hopeful. They gave us sticky cards to put next to the walls to monitor the bugs. You can tell the size by looking at the floor vent. But it kept getting worse. I called the pest company again. They were always very friendly and hopeful. I mentioned to the serviceman (he’ll know who he is because he is now a Spencer fan!) that they were losing money on me. He said they were there to solve my pest problems and that was their policy. A few weeks later, the owner of the company came out. He went over the whole property with me and made suggestions as to what else we could do. He felt very badly and said this was the worst he had seen. He also said that if we had not already been a customer they would not have come out because springtails are so hard to deal with. One reason is they are pretty resistant to the products they use. Per his suggestions, we removed all the mulch and rocks from the garden areas near the house. He said if it didn’t get better we’d go to the next step. Over his objections, I wrote a check. My daily bug routine became making the rounds of all the rooms and killing whatever bugs I saw that were moving. I also checked all the cards. That took an hour. I did that four times a day. So much for writing… and anything else. I also talked with two entymologists who said we were doing the right things and just had to keep doing them. Carol’s Internet research offered more suggestions and very little hope. One of our questions was how long does it take for them to stop multiplying and die if they don’t find moisture? One site said two years. The pest company was coming out almost every week to respray. They were only doing that to address my mental anguish. The product has a three-month residual effect, which is why they come quarterly. I realized that, but I just felt better if they were here with the spray. They were also laying down powder in bad areas, like around the sump pits. But the bugs didn’t stop. Sometime in July, it was time for the next step. It was obvious that they were living in the walls and getting in the house from window frames and baseboards and the fireplace and anywhere else there were cracks. I caulked every inch of baseboard and molding and window edges. That wasn’t fun, but the next step was worse. We had to get poison dust into the walls. That meant drilling a hole into every stud space in the house. That meant moving every piece of furniture away from the walls. That done, I caulked all the holes. At some point there’s painting, but that’s the least of our worries. In one room and hallway where the problem was especially persistent, I had to do the same in the ceilings. Since the walls were now accessible, I put those sticky cards next to every wall. There are 155 cards around the house. I have replaced them several times. When I first started I was seeing ten to fifteen bugs on most cards every day, but after the powder treatment the numbers started to decline. Carol then discovered a site that dealt specifically with springtails. They sold many products, some of which we ordered. One was a liquid to treat plant soil. Unfortunately, I had already thrown out several plants that I had for ten years, including a beautiful Christmas Cactus, because I found bugs. T here are two parts to this mystery. How do we get rid of the ones in the house, and how do we stop new ones from coming in? Early on, we addressed some cracks in the foundation walls with a waterproofing company. But I think the second part has been solved by another product we bought from the springtail fellow. It was a granule that he said would kill these things. We spread that around the foundation along with an “ant kill” product that purported to kill anything. They were crawling up the foundation and under or up the siding. A week after spreading the granules, I didn’t see the bugs in the soil next to the foundation. One problem solved, I hope. But we have to keep treating… for as long as we live here. Amazingly, our neighbors don’t appear to have this problem. The biggest question on the Internet from people who have this problem is, “Why do I have them and my neighbors don’t?” The only answer seems to be, “We won the springtail lottery.” Lucky us! The entymologists told me we had to find the moisture source in the house. Springtails look for moisture and then breed. They told me there must be a leaky pipe. We had someone come out with an infrared camera to do a moisture analysis. He was here twice, once after a rain—he found nothing out of the ordinary. I didn’t think he would find any specific spot. They were everywhere, and the whole house can’t be moist. Carol found another key factor on the Internet. One post recommended vacuuming to catch the bugs that made it past the poison barrier—and to vacuum every day. So, a few months ago we started vacuuming every inch of every floor, including moving most furniture. This has been consuming four hours a day for most of the last two months. Writing? It is now October. May seems like such a long time ago. Summer wasn’t so much fun. But we are winning the battle, I think. I now only look at the cards once a day. And, instead of counting over a thousand, I am seeing five to ten new ones in the whole house. But I won’t be happy until I see none. They have come in waves. I see large ones for a while and then suddenly tiny little ones, which means there is a new generation. I just found a couple small ones today in a spot where I had not seen any in weeks. I have no words for my reaction. We are still vacuuming, not the whole house every day, but close to it. I have a picture in my mind of bug-covered walls. The vacuuming may very well be needless, but until they are totally gone, I will vacuum just for peace of mind. And someone just today told me we have to treat the attic, which means vacuuming out all the blown-in insulation, treating the surface, and blowing it all back in. Where did I put those matches? So… Spencer. I plan on getting back to writing next week. This book needs to get out of my head and onto paper. I hope you never again hear the word springtail. I sure wish I hadn’t!